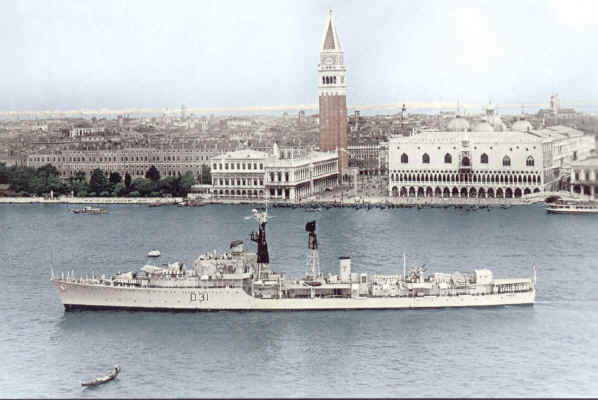 The cover photograph is of the Broadsword entering Venice on Monday 4th July 1960. It was one of the many photographs that John Gunson sent to me, and indeed it was one of his favorites. John was a Mech 1 who was serving on the ship at the time and was one of our oldest Association members. Sadly, only two days after our last issue of the newsletter John past away in Chatham. His daughter wrote to me saying that the newsletter was given to John while he was in hospital, just two days before he died, but, she went on to say that he was delighted that his photo had been included as an item in the newsletter and it brightened up his remaining days before he passed away. In his very last letter to me he mentioned that he wished to send his best wishes to everyone and hoped to attend the Reunion Dinner in Chester! sadly he wont be there but he will be remembered by the members and as a tribute to him I have used his picture as our 6th Edition cover. You will be sadly missed by us all John. Saw this in a recent mail order Auction and thought it should be returned to someone in the Broadsword Association. Perhaps you could auction it yourselves and raise funds for your Association. Wishing you all the best for the future. 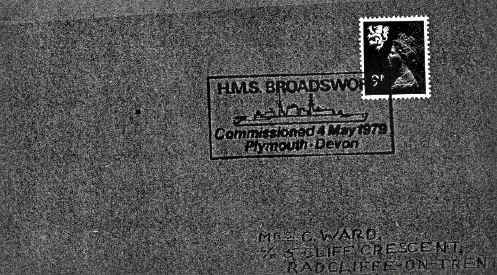 As you can see it is a first day issue envelope + stamp, with Broadsword Stamp on the commissioning day of the Type 22 Broadsword addressed to a Mrs. C Ward. I have checked my ships company lists and find no mention of a ward serving on the first commission but found three others on later commissions, possibly there is a connection but we now own it and we will be auctioning it at the reunion Dinner for those that are interested, all proceeds will go to the Broadsword Association. Tansy sent in the next item, it brought very old memories of my time in the Andrew. MISSING THE ROYAL NAVY LIFE? HERE'S HOW TO RECAPTURE THE ATMOSPHERE OF THE OLD DAYS AND SIMULATE LIVING ONBOARD SHIP ONCE MORE. 1. Build a shelf in the top of your wardrobe and sleep on it inside a smelly sleeping bag. Remove the wardrobe door and replace it with a curtain that's too small. 2. Wash your underwear every night in a bucket, then hang it over the water pipes to dry. 3. Four hours after you go to bed, have your wife wip open the curtain, shine a torch in your eyes, and say "Sorry mate, wrong pit". 4. Renovate your bath room. Build a wall across the center of the bath and move the showerhead down to chest level. Store beer cans in the shower enclosure. 5. When you have a shower, remember to turn the water off while you soap. 6. Every time there is a thunderstorm, sit in a wobbly rocking chair, and rock as hard as you can until your sick. 7. Put oil instead of water into a humidifier, then set it to 'high'. 8. Don't watch TV. except for movies in the middle of the night. For added realism have your family vote for which movie they want to see - then select a different one. 9. (Mandatory for engineering types) Leave a lawnmower running in your living room 24 hours a day to re-create the proper noise levels. 10. Have the paper boy give you a hair cut. 11. Once a week blow compressed air up through your chimney. Ensure that the wind carries the soot over into your neighbor's house. When he complains, laugh at him. 12. Buy a rubbish compactor, but only use it once a week. Store up your rubbish in the other side of your bath. 13. Wake up every night at midnight and make a sandwich out of anything you can, preferably using stale bread. Optional: Cold soup or canned ravioli, eaten out of the can. 14. Device your family menus a week in advance without looking in the fridge or larder. 15. Set your alarm clock to go off at random times through the night. When it goes off, leap out of bed, get dressed as fast as you can then run into the garden and break out the garden hose. 16. Once a month, take every major household appliance completely apart, then re-assemble. 17. Use 4 spoons of coffee per cup, allow it to sit for 3 hours before drinking. 18. Invite about 185 people you don't really like to come and stay for a couple of months. 19. Install a small florescent light tube under your coffee table, then lie under the table to read books. 20. Raise the thresholds and lower the top sills of all the doors in the house. Now you will always either hit your head or skin your shins when passing through them. 21. Put lock wires on the wheel nuts of the car. 22. When baking cakes, prop up one side of the cake tin while it is baking. When it has cooled, spread icing really thickly on one side to level it out again. 23. Every so often, throw your cat in the swimming pool or bath and shout "man overboard" then run into the kitchen and sweep all the dishes and pans onto the floor while yelling at your wife for not having secured for sea properly. 24. Put on the headphones from your stereo, do not plug them in. Go and stand in front of your dishwasher. Say to nobody in particular, "Dishwasher manned and ready sir" Stand there for three or four hours. Say once again to nobody in particular, "Dishwasher secured". Remove the headphones. Roll up the headphone cord and put them away. 25. Nickname your favorite shoes 'stearnies' then get your children to hide them around the house on a random basis. WHO IS THIS HANDSOME YOUNG LAD OF THE 1982-84 SHIPS COMPANY? Hardly a 'Young Bit of Skin' !!!!! If anyone recognises this rather old bit of skin drop me a line! That tracksuit looks familiar? The Broadsword association will hold its 3rd Annual Reunion at Chester Town Hall on 15th/16th November 2002. 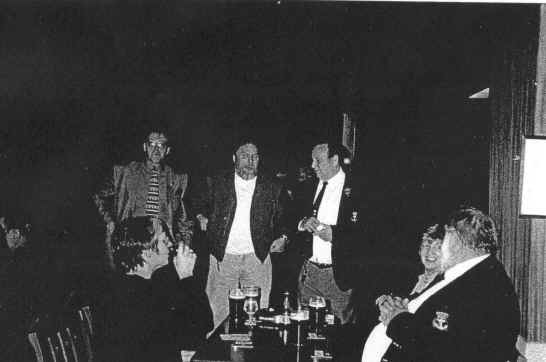 At the AGM held at Chester on the 18th November 2000 it was decided to hold a Commemorative Broadsword Dinner for the Associations Annual Reunion in the year 2002, the members present asked for costing and a proposed programme for the weekend. Members arrive at Chester all day. In the evening there will be an informal get together at the "Pied Bull" public house which is next to the Town Hall. There is no set time to arrive, you can call in at any time during normal drinking time, there is nothing organised, no food, no transport, and no rushing around! If you don't feel like coming, DON'T ! we will see you on the Saturday. 14:30 The AGM will take place at the Town Hall. (All members to attend please) Any broadsword memorabilia in stock will be available on sale during the AGM. No sales will take place during the evening! 19:30 Broadsword Up Spirits in the bar (cost £1.00 a tot) Upon arriving at the Town Hall all members and their guests are to sign the Guest Book in the Foyer to give a true number of those attending. 20:00 Broadswords will be called for dinner (seating plan will be used) the seating plan will be on display during the AGM, at the Up Spirits, and place names will be used on the tables. The meal will be Waiter/Waitress service, Unfortunately drinks will not be served during the meal, Bottles (House Reds and Whites) will be placed on the tables along with port for your consumption, you are asked to serve yourselves during the meal with drinks. A table will be placed conveniently close to the main table to enable you to replenish empty bottles. 23:00 approx Finish dinner, adjourn to the bar for refreshments. The cost of the dinner, with drinks, will come to the sum of £25.00 a head, we envisage that a total of 160 people will attend. harvey's Farmhouse caterers will be caterers for the evening. And the drinks + free glasses will be supplied by ashley Scott Wine Merchants (Both from Chester). Any breakage's will have to be paid for on return. It has been decided by your committee that we must have a cut off date for the organisation of the dinner At the moment the number of returns for the dinner are very low, to date only Eight have responded , but I am certain that everyone is waiting to get over Christmas before responding with their menus and monies! I urge you all as soon as it is over with, please forward your menus and cash to me as soon as possible to enable me to get on with the arrangements for the dinner. ALL Menus and monies must reach me by no later than Saturday 3lst AUGUST 2002. We cannot extend that date as Chester have to be contacted on a date no later than Monday, 7 October 2002 Remember that the cost of the dinner is £25.00 a head, if you are bringing a guest it will cost you a total of £50.00 for the dinner. Book now! Send your cheques now! It won’t hurt, its only paper money? Alan has written to me and told me that a lot of the subscriptions for this and last year have yet to be paid! If you have not paid yet please do so. We will need the money for the Reunion dinner and the following years. Forward your subscriptions to Alan and Dinner monies to me. Treasurers Quickie. Account to date and a report on the Mini Reunion in Guzz. A great weekend was had by all. Many faces not seen since 1982-83. We had the Broadsword gold medallist talking champion in our midst, Fez the Gunner Parker. It was really great to see him after so long. He kept us all entertained for the whole weekend. My wife almost split her sides listening to Fezbert!! Chris (Mrs P.) and he were kind enough to put up some of the lads for the duration. Or should itbe ‘put up with some of the lads’!!?? George Roche managed to get himself lost in ‘The Strip’ and phoned everyone to find out where he was! 1 had 3 messages on my mobile in the morning, 2 on my answer -phone at home, Keith was awoken (in Bristol) to an incomprehensible burbling at 0200, George’s wife was phoned in Sunderland and he asked her where he was and so on and so on!! ! ! !!! ! !!! He must have sounded something like a Janner because the taxi driver seemed to get what he was on about and found Fez’s house! Andy shot mat, ‘mensh’ in despatches, I’m now a lorry driver Coppel was there and Helen, his wife got a very loud rendition of Happy Birthday from the boys. Great to see them. Al ‘the corporal’ Wimpenny turned up. He’s still just as mad! Nice one Albert! Al brought his large mate along to see how it was really done! Nobby ‘give us a few more chips’ Cameron-Clarke and Missus were there in the thick of it. Stevie ‘the boy’ Bullock from Raleigh RAS Rig was in his best trapping kit.... and failed!! He also brought his ‘oppo George. Spider ‘the Website’ Webster. He is exactly the same except his hair is getting too small for him! Paddy ‘FTRS’ Paul. Still a ringer of his former self and speaks funny! Brum ‘whats the ty-im’ Dukes and Jane with their car that thought it was a kettle and boiled every 10 minutes! Thankyou Terry for that brief Audit and the report on Guzz, it sounds as if a good weekend was had by all who attended. *By Ed. Thank you George for sharing the experience with me at that ungodly time in the morning! It actually sounds funny now. Billy ‘the 18 pints of bitter please’ Billingham and Zena. Pedlar ‘I can weld anything’ Palmer. Nick ‘nee-nah — splosh! Its out’ Page. Tanzy ‘23 pints of Guinness and 2 large rums is far too much for one day’ Lee and Jen. Pictures on Broadsword Association website. You have no doubt heard the expressions ‘let the cat out of the bag’ and ‘no room to swing a cat’. Visualising a poor animal being stuffed into a bag or swung around by its tail seems to be a very strange and cruel idea! Those sayings come from the days which were indeed cruel, but have nothing to do with the domestic torn; they refer to the cat-o’-nine-tails, once used to administer floggings in the fleet. Because of our great maritime heritage, nautical words and expressions colour the English language. For example we ‘shove our oar in’, ‘rest on our oars’, ‘swim with the tide’ and can either ‘miss, ‘rock’ or be ‘in the same boat’. When a business is ‘on the rocks’, it is ‘all hands to the pumps’ and with a new man ‘at the helm’ the company ‘weathers the storm’. There are many sea terms which have become colloquial expressions, the original meanings of which have become forgotten. The following collection may enlighten or indeed perhaps surprise you, with the nautical connections. Quite a number come from different eras of the Royal Navy’s history. Others are from the Merchant Service, while some were once common to all seafarers. Many originate from the days of sail; working terms which, by the early part of this century had all but disappeared, but go on into the future as part of our everyday language. At the beginning of the 19th century, one in a thousand men were being discharged from the navy as insane This figure was high due to several reasons. A daily half pint of rum, frequent floggings and continual knocks and bumps from heavy gear, all contributed. Such was the problem that the navy had its own lunatic asylum, (not 3P1 mess either! ), the Bethlehem Royal Hospital in Moorfields, London, commonly known as ‘Bedlam’. Today this old hospital has become the Imperial War Museum. To be ‘on the black list’ was a form of punishment in the Royal Navy during the 19th century, which entailed waking earlier than the rest of the ships company and working after pipe down at night. Meals had to be taken on the upper deck under the eye of a sentry and work had to be carried out during normal meal times. Later modified to become ‘number 10A’. Before uniforms for ratings of the Royal Navy were standardised, a few ships captains dressed some of their crew in special rigs for prestige purposes. The captain of HMS BLAZER (Captain J. W. Washington, RN) had his boat’s crews dressed in blue and white striped jumpers. In wooden sailing ships, the seams between the hull timbers were caulked with oakum (old ropes fibres) and then filled with pitch. This operation was known as ‘to pay’ (from the French ‘poix’, meaning pitch). The upper outboard strake, or the garboard seam nearest the keel, was known as the ‘devil’ by the caulkers. There was very little space to reach this seam with the caulking iron, making it a difficult one to pay. This corruption of the 17th century term ‘freeze the balls of a brass monkey’. A ‘monkey’ was the cannon and in freezing temperatures the iron cannon balls and the brass cannon shrank at different rates, making the cannon impossible to fire. This was the order given to a gunner to remove his finger from the venthole of a muzzle loading cannon whilst it was being loaded. The hole was sealed by his finger to prevent gas in the gun chamber mixing with the air and exploding. The expression comes from the days when ‘Pusser’ dished out floggings and refers to the cat—o’-nine- tails which was kept in a red bag. The ‘cat’ was not taken out of the bag until the offender was secured to the gratings. By then beyond the possibility of a reprieve. No way out. Stuck with it. From securing a man over a gun barrel for flogging. An abbreviation of ‘Port Out and Starboard Home’. The letters P.0.S.H. were printed on the tickets of the wealthy first class passengers sailing in P&O ships to and from India. To avoid the intense heat when passing through the Indian Ocean, these passengers had cabins in the specified side of the ship, sheltered from the sun. To pacify act as peace maker. A method used when it was necessary to bring a boat alongside a ship in heavy seas. Oil was allowed to drip from a container onto the sea to form a slick and prevent waves from breaking. From ‘lobscouse’ which was a naval dish consisting of salt beef stewed with vegetables and biscuits. It was particularly popular in merchant ships with Liverpudlian crews. Lastly, on the back page you will find a map of Chester, purely for reference for the Reunion. You will also require accommodation for the weekend, certainly Saturday! If you contact The Chester Visitor Services on: Tel 01244 402111; Fax 01244 403 188; e-mail tis@Chestercc.gov.uk; or Website www.Chestercc.Gov.uk they will give you all the information you require + an information brochure. If you want any of the above items please contact Terry with your order. If you owe for any outstanding orders please also contact Terry with your Cheques. A member from RNA Capenhurst sent this photo to me, they seem to think it was some of our group’? it is! , the lady on the right slightly obscured by that astutely portly gentleman (sorry Dinger) is actually my wife June so I must have been there as well? Can you come up with a caption regarding the three central figures? Best caption wins a bottle of wine at the Dinner! Mine is: Look, I’ve got no English money, I can’t get a round in.